From floating down lazy rivers in round tubes to speeding down water slides and jumping cannon ball style into the deep end, water parks provide fun amusement for the entire family. The only downside to water-based activities is… the weather. Whether you go to the beach or an outdoor water park, your only chance of enjoying your time is if the weather cooperates. Thankfully, a group of geniuses thought, why not move all of the greatest water-activities indoors so weather can never dampen the mood? And thus, indoor water parks were birthed into existence. Today there are water parks cropping up all over the world. Some small, some large. Some exclusively indoors, some featuring a combination of indoor and outdoor activities. Yet, all of these parks have a foundational element in common: fun, fun, and more fun. Say goodbye to humidity, incredibly high temperatures, and sticky sunscreen that is always an inconvenience to slather on. Say sayonara to the fear of rain and storms interrupting your time in the water. The greatest thing about indoor water parks is that you can come in the heat of summer or in the chill of winter. Any time of the year you’re sure to have an exciting time splashing, laughing, and zooming down waterslides. Here are the 6 best indoor water parks all around the world. Water fun lines every square foot of this indoor water park complex. One important thing to note is that World Waterpark is the largest water park in all of North America. That alone says a lot. It is the reason why you should book your next vacation to Edmonton, Alberta, Canada. There are 21 water activities within the water park, including the world’s largest indoor wave pool. The water slides begin stories high. Some of them swirl and spin down into the clear pool below. Other slides go straight down, full speed ahead. Many of the rides are intense, fast, and designed for the thrill seekers. However, there is a section for children where kiddos age seven and under will likely be splish-splashing around. The park is located in West Edmonton Mall, which is clearly no ordinary mall. If you think a water park inside of a mall is strange, just you wait. In addition to a water park, the mall has an amusement park, an ice-skating rink, a bowling alley, two mini-golf courses, an underground aquarium, movie theaters, restaurants, bars, casinos, and of course, shopping. There are over 800 shops to be exact. Not your typical mall, right? For all of these reasons and more, a trip to World Waterpark is necessary. There is so much to do that you could easily spend several days in this massive, eventful mall. Given that World Waterpark is the largest water park in North America, it needed to be on our list of the best indoor water parks around the world. We are journeying to Krausnick, Germany for this next water park. The Tropical Islands Resorts is, in fact, the largest indoor water park in the entire world. The resort is complete with a beach, palm trees, a rainforest, waterslides, a whitewater river, mini-golf, a kids activity center, a sauna and spa, and island ballooning. What is island ballooning, you ask? Island ballooning allows guests to fly into the air, tethered or free-floating, and take in a unique, bird’s eye view of Tropical Islands. For the range of amusement options, the resort is well worth the trip. Guests can choose to stay in one of their comfort, standard rooms, or camp in the rainforest. That’s right, scattered throughout the rainforest area at Tropical Islands, there are canvas tents for guests to sleep in. The experience is unlike anything else. The tents can hold between two to four people and come equipped with mattresses, pillows, and a duvet cover. Just like regular outdoor camping, the tents have no electricity. Therefore, guests will have to charge their electronics at mobile charging stations set up around the grounds. The rainforest camp ground is also located only a short distance from toilets and showers. The camping experience at Tropical Island Resort is something we highly recommend. However, if even indoor camping isn’t your style, you will find spacious and comfortable rooms available to sleep in at the restort as well. Great Wolf Lodge has 16 locations within the United States and 1 location in Canada (Niagara Falls to be exact!). Whether you call the East Coast, West Coast, or anywhere in between home, there is bound to be a Great Wolf Lodge relatively close to you. Water slides of all heights and twists and turns invite guests to grab a tube and set off for a fun ride. Many locations have lazy rivers, whirl pools, and others attractions. Set at a comfortable 84-degrees, the indoor water park is always ready for you and your family’s arrival. In addition to housing an indoor water park, Great Wolf Lodge provides exquisite dining, shopping, games (some locations have a bowling alley and mini golf course), and comfy suites for guests to stay in. This cozy wooden lodge allows for guests to sleep only feet away for the indoor water park. Wake up in the morning, put on our swimsuit, and hurry down the stairs into this wonderful water escape. It doesn’t get more convenient than that. 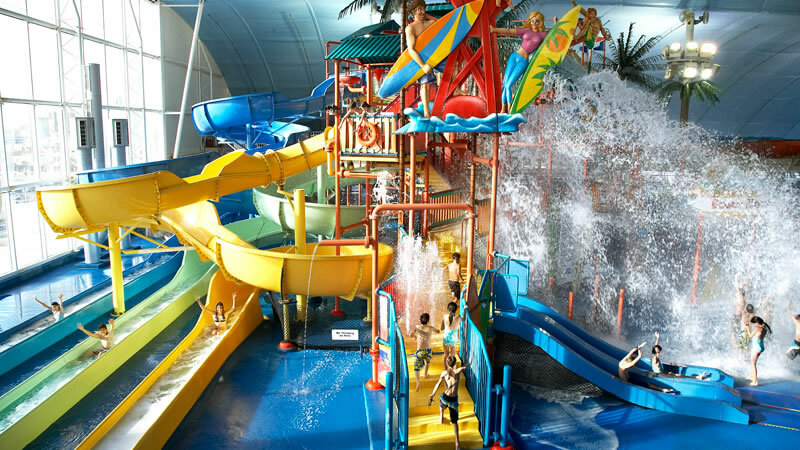 Kalahari Water Park is the largest indoor water park in the United States and therefore has loads of water activities for guests to participate in. 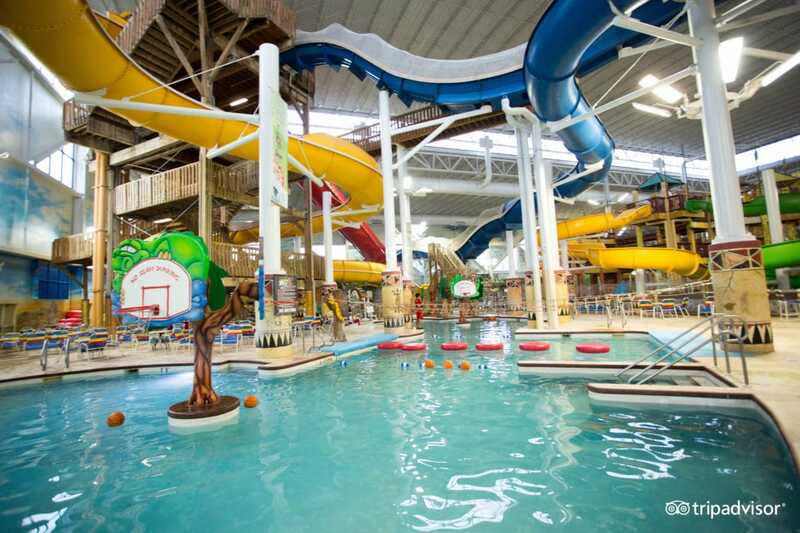 The water activities at Kalahari including indoor surfing and bodyboarding, in addition to tons of water slides, hot tubs, a wave pool, a lazy river, and more. It is extremely rare that someone gets bored at Kalahari. Guests can even rent a private cabana where there is access to a television, refrigerator, tables, and chairs to lounge in. What’s more is that adults can swim up to their swim bar and order a drink, or stroll into their indoor spa for a relaxing afternoon. There are 3 Kalahari resorts spread throughout the United States. The locations include Sandusky, OH, Round Rock, TX, and Pocono Mountains, PA. The resort in Pennsylvania’s Pocono Mountains is currently the largest indoor water park in the states. 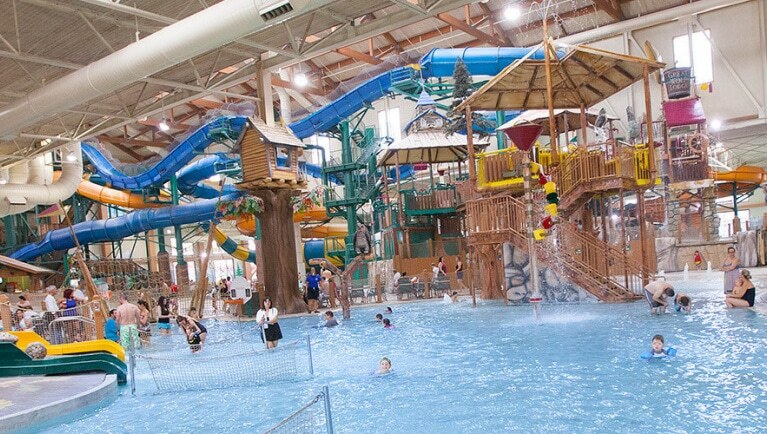 Fallsview Indoor Waterpark is located in Niagara Falls, Ontario and provides 3 acres of indoor water park fun. The park is only two minutes from Niagara Falls, making it an ideal spot to swing by on your way to or from the falls. Located within this water park are 16 waterslides, a wave pool, hot springs, an indoor beach, and when the weather is behaving, an outdoor patio and pool. Of the 16 exciting waterslides, there are various height requirements for each. Yet, at Fallsview, each person in your family – young or old, tall or short – will be able to find fitting and thrilling rides just for them. There is even a Tiny Tots Splash Park with mini slides and water games that tiny tots will love. We recommend standing under the Niagara Tipping Bucket and waiting for the bell the ring. Be prepared to get doused in gallons of waters. Aquaworld is located in Budapest, Hungary and guest can easily spend hours and hours within this indoor water park. For the adrenaline junkies, you’ll find your place among the 11 giant water slides at the water park. There are also wave pools, surf pools, Jacuzzis, and more. There is even an outdoor area with pools and water activities for guests to enjoy on warm days. A separate kids world allows for young kids to find water activities created just for them. For those traveling through Budapest and craving a new adventurous experience, we recommend checking out Aquaworld. Which of These Indoor Water Parks is Calling Your Name? Rain or snow cannot and will not ruin your day of fun when venturing to one of these indoor water parks. Of all the indoor water parks in the world, these 6 are largest and best you’ll find out there. Fit with wave pools, lazy rivers, spas, slides, and surfing, adventure-seeking families will feel right at home within these parks. Many of these destinations have lodging accommodations, making it convenient for you and your family to sleep comfortably after a day of exhausting fun at the park. So, really, which of these 6 best indoor water parks is calling your name? Tell us about it in the comments section below.